Teams that forfeit will be fined $20.00. Any forfeits during the last 5 weeks of play will be fined $25.00. These will be deducted at the end of the season from the team’s winnings. Dues must be paid to the machine before your games will begin. The machine will not start play until the dues are paid for both teams in full! Once the dues are paid the machine will allow you to set up the matches. Dues are $5.00 per person per night. This $5.00 does not include your cost for the matches. If any team drops out of the league they forfeit all money. THE GAME IS 501, CRICKET, AND 701. Teams will consist of 4 players (men or women) a total of 13 games will be played each week. All players will pair-up and play 6 games each week according to the score sheet. ALL PLAYERS WILL PLAY IN THE 13TH GAME 701. GAMES 1-12 will be alternating games of 01 and CRICKET. Teams will get 1 point per win. All regular players must play a minimum of 3 matches for the same team to be eligible for the play-offs.MAKE SURE YOUR PLAYERS ARE ELIGIBLE FOR THE PLAY-OFFS. GAME TIME IS 7:00 PM. Teams will have 15 minutes to show. At that time, the team enters their name into the machine and follows the instructions on the game for the forfeit. Forfeiture score is 13-0. In case of extenuating circumstances, games must be made up within 1 week. Captains are responsible to contact each other to schedule a make-up match and to notify Stanton Automatics of the make-up decision. Captains are responsible for their players during the match. Stanton Automatics, 2150 Ellis Dr., Auburn, NY 13021 within 48 hours. 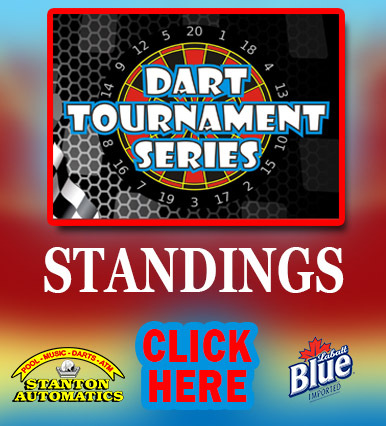 Refer to Stanton Automatics dart league rules for any additional specific rules. All team members may discuss a shot once a player is at the foul line. Each team may have an unlimited amount of subs. You must use the sub’s full name. No nicknames! If an error is made when putting in the name, contact Stanton Automatics to make the correction. This will allow verification of subs at the end of the season and for play-offs. Subs may not have a higher average than the highest player of your team. If you only use a nickname for a sub and there is a question regarding eligibility, the games they played in will be a loss. Any person signed up as a regular may not sub. Once you have subbed for a team you may only sub for teams from that bar. Subs must play 3 matches for the same team to be eligible for the play-offs. NO NEW SUBS may be brought in the last 5 weeks of the league. Players stand at the “throw line”, 96 inches horizontally from the face of the dart board. It is legal to lean over the line. They may step on, but not across, the line. Flights may be any length as long as they do not exceed 8″ in total length. Flights may be no wider than 3/4″. As measured from shaft to flight edge, and may not have more than four wings. Each player throws a maximum of three darts per turn. Darts must be thrown only when the machine instructs to “Throw Darts” and the proper player’s name is lit. A player will always be allowed to throw all three of their darts. Any dart thrown counts as a throw, whether or not it is registered on the machine. A throw counts if is misses the board and bounces out, or it misses the board completely. A player may not throw any darts over again. Dropped darts may be thrown again. Darts on the board may not be touched until the turn is over, the “Player Change” is activated, and the machine recognizes the end of the turn. Exception: When a dart is in the board and machine reads “Stuck Segment”, that dart must be removed before other darts are thrown. A round is defined as the period of time from the end of a player’s turn to the start of their next turn. In a game that is played with two players sharing a score, a round is defined as the period of time from the end of a players turn to the start of their partner’s turn. “Last Dart-Winning Dart” If the machine was displaying the “Throw Darts” message and all other rules were followed and the dart is sticking in the exact number needed to take out a game it will be scored. A dart that sticks in the board and registers as a dart thrown but does not score will be corrected (the dart shows as “missed” or “blank”). Any dart that registers two or more times will be corrected by removing the extra points awarded by using the back up button. If a dart bounces it is considered a dart thrown even if it does not score. It may NOT be thrown again. If a dart thrown before the “Throw Darts” message lights, the dart will not score and is considered a dart thrown. It may NOT be thrown again. The CANCEL button is NOT a backup – Pushing it will end the match and team that cancelled will forfeit remaining games.